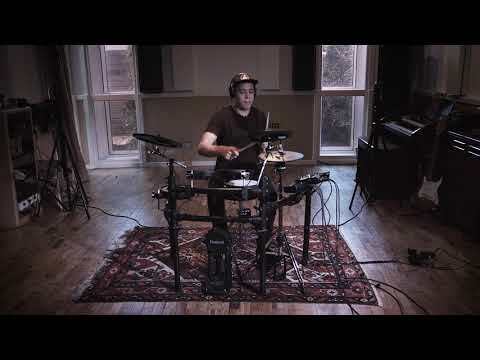 The Roland TD-25KV is the ultimate hybrid drum kit for home and studio. Built using some of the most dynamic and inspiring sounds from the f.. 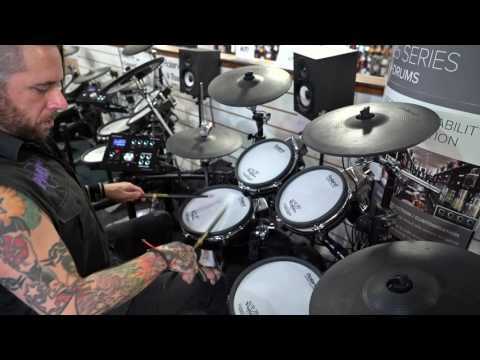 The Roland TD-25KV is the ultimate hybrid drum kit for home and studio. Built using some of the most dynamic and inspiring sounds from the flagship TD-30 series, the TD25KV enables a truly authentic drum playing experience thanks to mesh head upgrades, positional snare sensors and the expressive new VH-11 Hi-Hat. Building your own custom kits and sharing them with the world is now a reality with the TD25. Great sound is one thing but it's the integration with Roland drum hardware where the TD-25KV really shines, offering you different articulations through flams, rim shots, swells and rolls. One incredible electronic brain for a truly expressive instrument. Along with being a great drum kit for live playing or in the studio, the TD-25 also offers a range of record/playback and practice features that allow you to get your chops down playing at home. The difference between the TD-25KV and the TD-11 comes in the form of upgraded Toms and the Cymbals. Roland have given this kit 6.5” PDX-6 Mesh Head Tom Pads which like its 8” Snare counterpart, gives the user the accurate dual triggering technology and even sensing from head to rim. Again a further upgrade is in the cymbals department. The CY-12C Crash Cymbal gives the crash natural swinging motion and choke control. The CY-13R Ride Cymbal gives the user an enlarged bow area, realistic playing field and accurate control over edge, bow and bell triggers. The TD-25KV has onboard sensing technology with Behaviour Modelling giving the user a more natural drumming experience. It has 50 kits onboard and a huge sound library for performance and practicing. It contains amazing backing tracks to play along with and a COACH function which helps you develop your skills as a drummer. With its compact footprint, the TD25KV can be used in a small room, rehearsal space or in live situations where space is a premium. A USB function allows you to connect the electronic drum kit directly to your computer, DAW and lets you play back original songs to play along with. The TD-25KV delivers a superior drumming experience, thanks to Roland’s SuperNATURAL technology with Behavior Modeling inherited from the flagship TD-30. The sound engine responds naturally and organically to your playing in every way, providing the dynamic, interactive feel that’s essential for reaching the highest levels of musical expression. From rim shots, rolls, flams, and ghost notes on the snare to dramatic crash hits and sustained cymbal swells, every nuance is detailed, accurate, and ultra-smooth. When you sit down at the TD-25KV, you’ll enjoy expressive playability that rivals high-end V-Drums sets. There’s a full compliment of mesh-head pads for the legendary V-Drums feel, with positional sensing on the snare pad that provides subtle, organic tonal changes depending on where the pad is struck. The cymbals have a natural swinging motion and support chokes, bow/edge sounds on crashes, and bow/edge/bell sounds on the ride. Mounting on a standard hi-hat stand, the VH-11 V-Hi-Hat features open/closed motion and bow/edge sounds for executing traditional playing techniques to perfection. Last but not least is the KD-9 Kick Pad, which offers a natural-feel cloth head and rock-solid response. With its no-nonsense interface, the sound module lets you enjoy playing great sounds for any music right away. Easy to grab while holding sticks, the large center dial allows you to quickly select kits based on music styles such as standard, rock, jazz, electronic, and others. After you’ve selected a style, press the dial to toggle between different kit variations. Next step? Start playing! The Roland TD-25KV makes it simple to edit sounds to suit your playing touch or a specific style of music. Just hit a pad to call up the sound assigned to it, and then use the module’s knobs to select instruments and tweak tuning, muffling, and levels. Handy shortcuts greatly speed up tom editing, allowing you to assign sounds and change the muffling and tuning for all the toms at once. Your changes are saved automatically as you edit, eliminating the need to fuss with extra steps. If you don’t like your most recent tweaks, you can easily undo them and return to where the kit was at when you first selected it.